Bots are becoming more and more prevalent on the Internet. The power of "Internet Robots" runs from simple web crawlers to dependable assistants to curious creatures trying to learn and grow on their own. The promise of 'bots is that they willfree humans to focus on more important and interesting things. But most online bots require lots of investment in design, implementation, and maintenance. Some even require human "trainers" to ensure they continue to operate properly. And some clearly don’t "operate properly" when left to fend for themselves against humans and other 'bots on the 'net. So are bots a good thing or not? 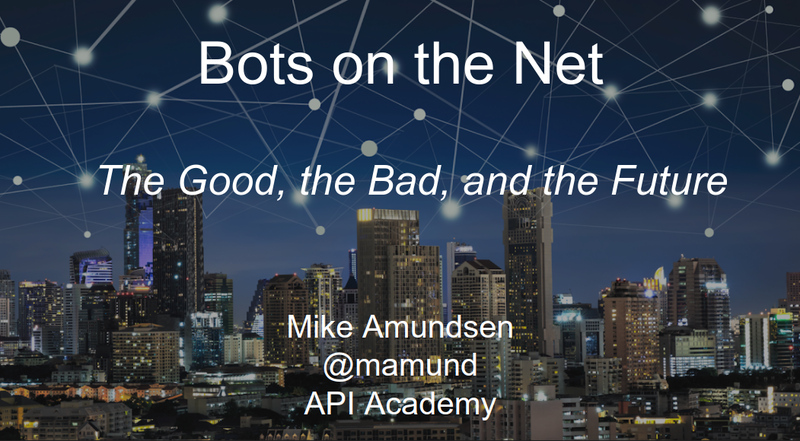 In this lively talk, Mike Amundsen touches on the history of software bots from Liza and Parry to Clippy and MOMSpider to Siri, chatbots and more. We’ll explore both learning and non-learning machines and discuss the different ways in which machines can "learn" including the difference between "specialized" and "generalized" AI. Finally, we’ll review the challenges to 'bots on the 'net including shortcomings in AI and learning, inbuilt and acquired bias, truth, trust, and security, and the effects 'bots will have on jobs and the economy. Through it all we’ll be looking at what the future holds for both humans and machines when we live in a world of 'bots on the 'net. An internationally known author and lecturer, Mike Amundsen travels throughout the world consulting and speaking on a wide range of topics including distributed network architecture, Web application development, and other subjects. In his role of Director of Architecture for the API Academy, Amundsen heads up the API Architecture and Design Practice in North America. He is responsible for working with companies to provide insight on how best to capitalize on the myriad opportunities APIs present to both consumers and the enterprise. Amundsen has authored numerous books and papers on programming over the last 15 years. His collaboration with Leonard Richardson titled "RESTful Web APIs" was published in 2013. His 2011 book, “Building Hypermedia APIs with HTML5 and Node”, is an oft-cited reference on building adaptable Web applications. O’Reilly Media released his latest book - "RESTful Web Clients" in March of 2017.